I'm glad Escape Room went up. I can't believe Bohemian Rhapsody increased again. They should definitely expand again next weekend since it's winning Best Actor tonight at the Globes I think. Great hold for Vice. Didn't really expect it to hold that well with the chilly response from audiences but I suppose it helps it's Globes weekend. Pretty much everything held great this weekend though outside of Holmes & Watson and The Grinch. H&W is a disaster. A comedy starring those two and releasing on Christmas and it's only going to reach maybe 35 Million? That's pathetic. Mary Poppins shouldn’t have dropped harder than Into the Woods. Disappointing. Strange that it barely increased from Thurs to Fri or Fri to Sat. lol @ Mary Poppins dropping harder than Aquaman. Disney really dropped the ball with this December. Maybe Poppins and Ralph should've switched release dates, but the Poppins Christmas release date on paper seemed like such a perfect idea. Oh well. H&W is a disaster. A comedy starring those two and releasing on Christmas and it's only going to reach maybe 35 Million? That's pathetic. Eh, the writing was on the wall. Will Ferrel is kind of washed up at this point. The House did a lot worse. And I honestly forgot John C Reily existed. I honestly think the December release for Mary may have prevented a sub-$80m total for the film. Nobody asked for an old-fashioned, unnecessary retread of the 60's classic. The holidays may have prevented a truly epic disaster. I know I wouldn't have seem it if not for the christmastime release. how am I not myself? Yes I now think this also. I guess Disney thought this needed propping up more than Solo did and hence why they left Solo to open only 5 months after the last SW film - dooming it to under perform even more so than it would have anyway. Yeah, this was looking at sub $100m for sure in the summer. I wonder what Christopher Robin would have done in December though. Both it and Mary Poppins are pretty similar films. 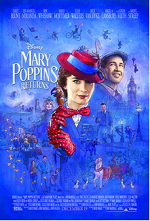 I don't think Mary Poppins is a flop or a huge disappointment for the type of film it is. It's going to end up with more admissions than Les Miserables and La La Land, at least domestically. That's about as high as musicals go nowadays, and a very solid total. The problem is that Disney positioned it as a big budget tentpole to compete with Aquaman, and it didn't live up to those expectations (or its budget) at all. Good to see that The Mule is likely to inch past $100m.